Techdirt Podcast Episode 80: Can Direct Democracy Work? 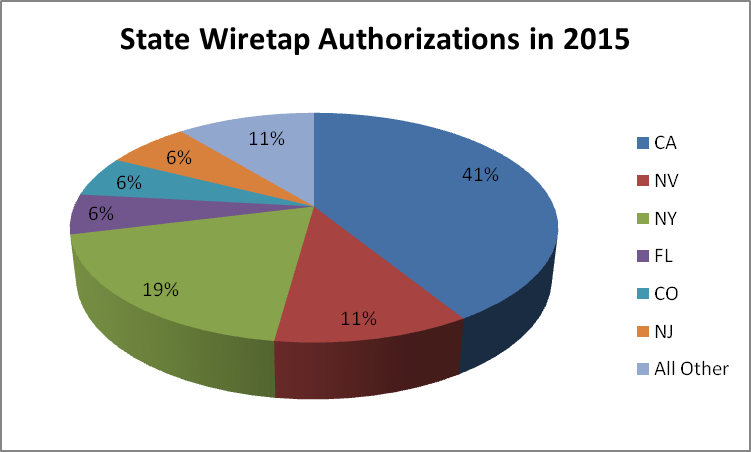 Despite a 21 percent increase in wiretaps authorized by state courts overall between 2014 and 2015, the number of cases where law enforcement encountered encryption decreased from 22 to seven. And out of 1,403 wiretaps authorized by federal judges, only six encountered encrypted communication. Two of those were decrypted by law enforcement, leaving only four that could not be deciphered. That means that in 2015, out of 4,148 total wiretaps, only 11 encountered a form of encryption law enforcement could not break. That’s about one quarter of one percent. Not so fast. The lack of issues in this report doesn't necessarily mean law enforcement agencies aren't encountering encryption. It simply means they're not running into it while utilizing wiretaps. There's a lot this report doesn't cover and there are many instances where the chance of running into encryption that renders wiretaps useless is simply being avoided. Why do the paperwork if there's nothing to be acquired? This is basically what the FBI told Motherboard in response to questions about the lack of encryption roadblocks shown in the report. The FBI pointed to other reports more closely aligned with Comey's anti-encryption proselytizing. The spokesperson added that ”a better representation” of the going dark problem is the number of devices that the Computer Analysis Response Team (CART) and Regional Computer Forensic Laboratory (RCFL), the FBI teams that help state and local police with technical requests, have been unable to unlock due to being encrypted. ”Over the 6-month period from October 1, 2015 – March 31, 2016, approximately 4,000 devices were submitted for digital forensic analysis. About 500 of those could not be unlocked,” FBI spokesperson Christopher Allen said. Apples and oranges. But that's to be expected. One report deals with wiretap warrants obtained under one legal authority. The other deals with search warrants obtained under another. Wiretaps will rarely run into encryption because there are a wealth of options available to obtain communications that don't involve intercepting them... or more closely reflect the current reality of communications -- which isn't tied to plain old telephone service. Whatever the government is doing with these other options can't easily be examined by the general public because there are no reporting requirements tied to these, unlike wiretap warrants. So, the number of times where encrypted communications (not contained in locked phones) are holding up law enforcement cannot be nailed down with any certainty. The DOJ could collect and disseminate this data, but it would certainly prefer to keep its reporting requirements to a minimum, even if this data would back up Comey's encryption histrionics. What hasn't changed, however, is what wiretaps are used for: drugs. 3,367 or 4,148 issued in 2015 were for narcotics investigations. And for those of you who have followed the explosion of possibly illegal wiretaps originating from a single county courthouse in California, it's no surprise the state issuing the most federal wiretap orders is that particular coastal "drug corridor." And, if law enforcement only ran into encryption in ¼ of 1% of wiretap orders, it ran into adversarial judges even less: every single one of the 4,148 federal wiretap requests was granted in 2015. Taking James Comey at his word that encryption is a huge problem, it would appear the DOJ would rather withhold any data that supports this assertion than develop a precedent it doesn't like: additional reporting requirements on the ECPA orders, NSLs, and regular old search warrants it uses to obtain digital communications. Almost everything in this report deals with old-fashioned landlines, so its depiction of federal surveillance is woefully incomplete. So, for #2, presumably it goes something like this? No -> Great! get the warrant, even though we've already infringed someone's rights. No -> Damnit - let's keep searching for more stuff to tap before we bother getting a warrant to do so.